Both were major events, with the cat modeling firm AIR estimating New Zealand’s losses between $3.5 billion and $8 billion. Losses from the Chilean quake top $8 billion, according to Aon. Despite significant losses from the quake, the Aon report pointed to important successes in the aftermath of the Chilean event. The insurance system worked effectively. No insurers faced insolvency or bankruptcy. Claims have been handled efficiently – 95 percent of residential claims and 80 percent of commercial claims have been settled. Reinsurers – which sell protection so insurers can hedge their risk – filled their role well. But challenges remain. Many personal-lines claimants did not understand their policies had deductibles. The sheer volume of claims (nearly 250,000) created bottlenecks, especially since government regulations require registered claims adjusters. There were issues in which different policies had overlapping coverage. And the market lacks a standard policy, complicating the settlement of claims. Aon also praised the regulatory environment. Regulators require insurers to track their earthquake exposure and purchase reinsurance accordingly, which in this case helped guarantee that insurers could meet their obligations. And lenders require earthquake insurance on mortgaged property. 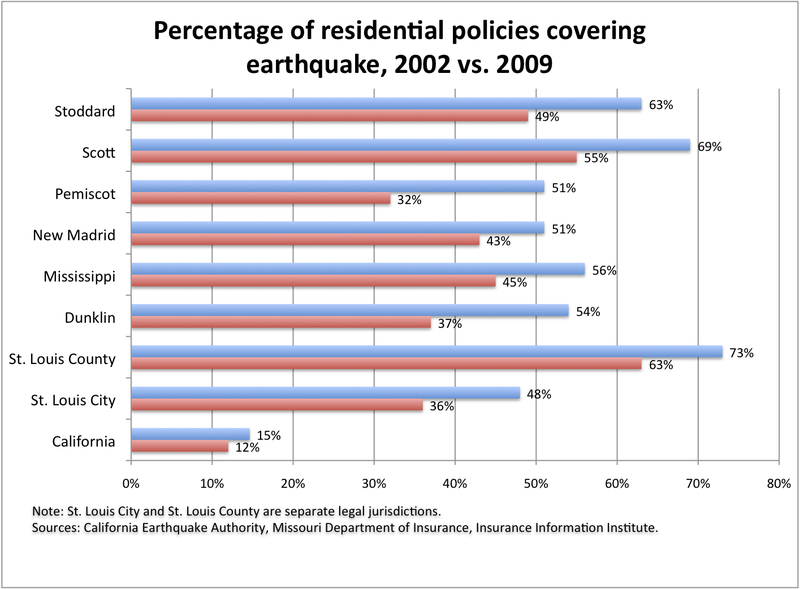 As a result, 24 percent of residential properties have earthquake insurance. That’s less than New Zealand, where all residential insurance policies include a surcharge for up to $100,000 coverage (in New Zealand dollars – about $75,000 U.S.) in the goverment’s earthquake pool. But it’s twice the take-up rate seen in California. Last year, a I.I.I. white paper on the state risk pool, the California Earthquake Authority, noted “the percentage of policyholders buying the coverage appears to rise and fall depending on how long ago the last significant earthquake occurred.” In 1996, about one-third of residential policies in the state purchased earthquake cover. Today, 12 percent do. I got information on California’s take-up rate here. You can see that California’s take-up rate is considerably lower than the selected Missouri locations. But all of them are declining. Meanwhile, Missouri’s neighbor to the south, Arkansas, had two sets of widely felt earthquakes in February, according to the U.S. Geological Survey, and California had a notable shake Jan. 8. Thankfully, all were minor. Good article. I work in the insurance business. Just one point- the earthquake in Chile was near Concepcion, not Valparaiso which is about 350 miles north of where the earthquake hit.